Guava is a rich souce of dietary fiber, Vitamin C, Vitamin A and Vitamin E. It also contains folic acid, potassium, manganese and copper. Guava is a laxative fruit. Being a rich souce of dietary fiber, it helps to cure constipation. Guava is packed with vitamins and minerals that help to keep the skin healthy, fresh and wrinkle free. 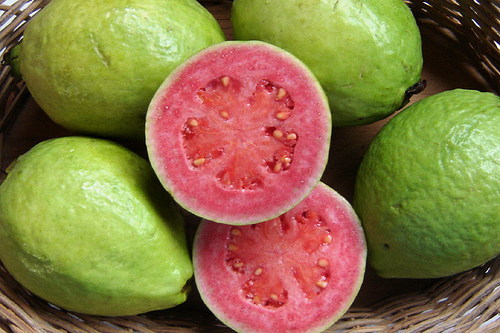 Guava contains the powerful antioxidant Vitamin C to boost the immune system. It plays a vital role and helps in cancer prevention and anti-aging. Magnesium in guavas helps to relax the nerves and muscles in the body. Potassium in guavas helps to regulate the blood pressure by reversing the role of sodium in unbalancing the normal blood pressure. Guava is rich in Vitamin C which helps to prevent the viral infections like cold and cough. It also effectively helps in treating scurvy. Guava has very good astringent properties. It helps in treating gastrointestinal problems such as diarrhea or dysentery. Vitamin A and the fiber content in guava helps to protect the colon mucous membrane. Guava is a cholesterol free fruit. It satisfies and keeps the stomach free from hunger for a long time. It assists in weight reduction and helps to control diabetes. Guava is also a great fruit to juice with. It can take the edge off of dark green vegetables/leaves and make for a naturally sweeter energy drink. This entry was posted in Health Tips. Bookmark the permalink.